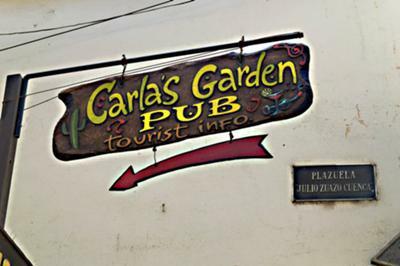 This a fairly new addition to the night scene in the cloud forest of Los Yungas, however, Carla's Garden Pub is rapidly becoming THE night spot for travelers and locals alike. Not yet appearing in the guidebooks, it´s word of mouth that has been driving the popularity of this pub. Now that´s perfect endorsement, isn´t it! Just down the steps from the main plaza, the bar is an open faced affair located in an ample garden with an array of tropical plants growing verdant and lush. You´ll meet people from all over the world as the Dutch Carla & her Bolivian beau, Andres, serve up cocktails, cold beer and good conversation. All of which are rather important after biking the Death Road, hiking the Inca Trail or spending the afternoon around one of the pools you´ll discover in Coroico! Drop in when traveling out that way. You´re sure to find me there! By the way, Andres is an avid outdoorsman. He acts as a guide and provides information about local flora & fauna. One recent evening I overheard him giving river advice to a fly fisherman over maps and a cold one. That´s called civilized reconnoitering, no? Copyright © Mick Huerta 2011. All Rights Reserved. Hey sweet carla...how are things?listen me and my friends band mayhem (norxay)ate playing a concert in cochabamba...the singer my best frienf is extreemly intetested in..the ancient ruins of tiwanaka?. .you know the bolivoan machu pichu...do you think 1..you cpuld arrange a jeeptour for the band abou 5 people of course you +1 will be on the geustlist!! !neginning of october in cochz..MAYHEM. I highly recommend Carla's Garden Pub. It is a lot of fun and Carla is very sweet. Just watch out for the Bolivian liquor Agwa. In 3 weeks I´ll be there! I´ll make sure to visit Carla and Andres. Thanks! Join in and write your own page! It's easy to do. How? Simply click here to return to Coroico.